Medium size (18cm x 39cm / 7" x 15.5") for tanks 67 litres (15 gallons) and larger. Unique self levelling feature automatically adjusts to water levels. Submerged ramp allows turtles easy access to dry area. 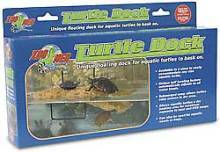 Allows aquatic turtles a dry basking area for maximum exposure to heat and UVB lamps.